It's so beautiful, I was born there but I moved to Aussie.Went there at x-mas, it rained, but I had a blast, spent it with whanau.It's a very big tourist place, there are lots of jade factories, but I like to call it pounamu, not jade.You should try Stumpers, or go to the pub, The Railway, it's exelent. Yeah, it's great.Theres a library on the right hand side, the white building.Your right, Stumpers is gr8.They have BRILLIANT bacon and egg pie. Ur all right, it's gr8.Even if it does rain, u can always shelter in Stumpers.They've got gr8 customer service and everything.But u no wats gr8 on a hot day?, Cass Square! !In other terms, THE PARK!!! !There's lots of fun equipment u can play on(Even if ur an adult)and there's a half pipe for the kids, it's fun.I remember when I used to go there. I was about five, and I used to slide down there on my but, I had a gr8 time.U should try it!Anyway, bak to the town. 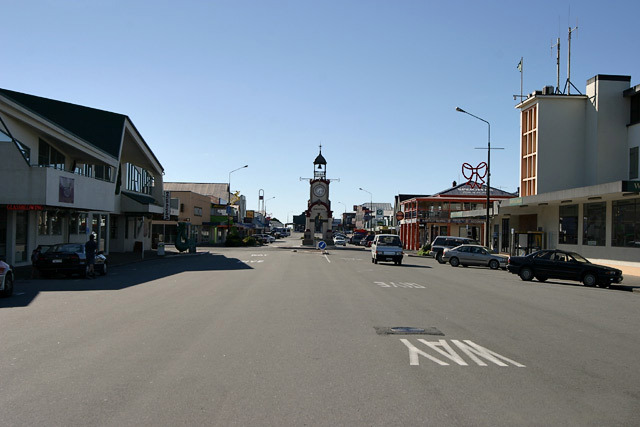 There's a massive town clock in the middle of it.For me, it represents Hokitika.It's AWSOME!! !GO THERE!!! Hokitika Photo Gallery No portion of this page, text, photos, images or code may be copied, reproduced, published or distributed in any medium without the expressed written permission of the copyright holder. Including this photo of Hokitika.